Meet FATHER JOSEPH VIEIRA — pastor of Holy Nativity parish in Payson, AZ. Father Joseph is a member of the Personal ORDINARIATE of the Chair of St. Peter. What? Is this a Catholic priest we’re bringing to you on this Catholic Vitamins show? Yes. Well, what is this Ordinariate about? The establishment of the Personal Ordinariate of the Chair of Saint Peter was the Vatican’s pastoral response to repeated and persistent inquiries made by Anglican individuals and groups in the United States and Canada who, over time, have come to identify the Catholic Church as their home. Those joining the Ordinariate have discerned they are truly Catholic in what they believe and desire full membership in the Catholic Church. 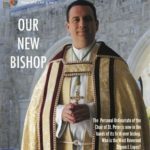 Pictured above is the first Bishop from the Ordinariate – His Excellency Bishop Steven Lopes. And so, our Catholic Vitamins show is devoted to meeting one priest – one representative of the clergy from this ‘diocese’ with headquarters in Houston, TX. What makes this interview with Father Joseph interesting is his faith ‘walk’ from Baptist to other, liturgical-oriented churches to the recognition that a holy and beautiful Mass was the form of worship he, Father Joseph was called to. Little did he realize early on that he would be a part of the call to ‘come home’ to the Catholic Church – in full union with Rome. This entry was posted in Podcasts and tagged Vitamin O. Bookmark the permalink.